Published by GALILEO Publishing Co.,Ltd. This issue is broken into three large sections. The first 4 pages have colour profiles of Tiger 1 cam schemes. This section should be sub-titled 'Everything you ever wanted to know about the M24 pictorially". 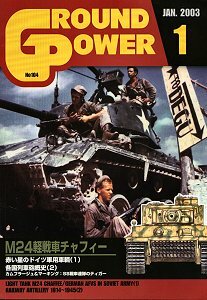 The first 12 pages cover the development of the light tank to replace the M3/M5 series and has a fair bit of text (in Japanese) along with a number of photos of the T7/M7 light tank. The next 37 pages are packed full of close up detail photos of the Chaffee including many from the US Army field manual. As well as the incredible detail shots of the exterior there is probably more on the interior. Everything from the driver's station with instrument panel, gear levers and seating shown in superb detail, the turret interior and central fighting compartment is in equally stunning close up showing the gun, gun mount and auxiliary equipment. There are line cutaway drawings showing the interior layout of the main components as well as four view 1/35 plans. The pages on the engine are simply outstanding with photos from the manual showing the engine(s) in and out of the vehicle, along with close ups of individual components with the wiring and radiator plumbing clearly shown. The transmission and drive train aren't forgotten with one overhead shot showing the main drive train with the floor plates removed as well as the gearbox, differential and final drives with the sprockets removed. The exterior is equally well covered with the suspension covered with more manual photos as well as close ups of the wheels, drive sprocket and idler wheels. The hull and turret exterior details such as hatches, engine decks right down to close up shots of the fuel filler caps. This is the next best thing from having the manual itself with the addition of the close up photos. The next 6 pages cover the special developments based on the Chaffee chassis such as the T6E1 recovery vehicle, a couple of dozer blade attachments and wider tracks test fitted to a few Chaffees. The next 11 pages show the Chaffee in use with other countries post WWII from the Norwegian NM-116 upgrade to those used by Austria, Pakistan, Uruguay, Great Britain test vehicles and the large number used by reinvigorated Japanese JSGDF. Finally there are 25 pages of inaction shots of the Chaffee from WWII to Korea to Indo China. Quite a few of these shots have been seen in other publications but with the incredible details in the first sections, who really cares. In all this is a sensational coverage of the Chaffee and will provide more than enough details to make most modellers happy. Some interesting shots of Panzer IIIs, Stug IIIs plus 38(t)s and halftracks in Russian use, all are wartime photos obviously and offer some interesting markings variations. Part 2 of Railway guns. It features wartime in action photos of the large and larger German Railway guns of WWII. Some of the shots showing the reloading sequences offer an insight into the crews who manned these monsters and the heavy workload needed to keep them in action. Another superb issue of this magazine especially if your looking for details on the Chaffee. Available via mail order from Rainbow Ten in Japan.